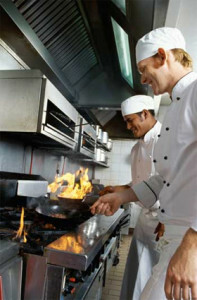 Swamp coolers are very important to commercial kitchens. By providing cool, fresh air to the kitchen, swamp coolers help make slaving over a hot stove for a living bearable for chefs and their assistants. Here’s how to tell if you need swamp cooler service Culver City CA. Swamp coolers produce a cooling effect by causing water to evaporate off of special pads inside the unit. When the swamp cooler stops working properly, you’ll notice your kitchen temperatures steadily climbing, as you continue to cook but lack a source of fresh, cool air. The best way to figure out exactly what’s wrong with your swamp cooler is to call the pros at Flue Steam. Your kitchen exhaust system normally whisks away smoky or smelly air, and your swamp cooler replaces that lost air with clean, fresh, cool air. When this cycle gets interrupted, you can end up with some very uncomfortable and unpleasant conditions in your kitchen. If you notice that smoke or odors seem to linger longer than they should even though your exhaust fan is working normally, call Flue Steam for swamp cooler service Culver City CA. If the hot air exiting the kitchen through the exhaust system is not replaced with cool air from your swamp cooler, you can end up with a vacuum effect in your kitchen. One sign of this condition is doors that slam shut every time someone goes in or out of the kitchen. Often, the root cause of the problem is an issue with the swamp cooler’s fan or fan motor, which is preventing the cooled air generated inside the unit from getting pushed into your kitchen. If you notice water leaking from the area around your swamp cooler, you need swamp cooler service Culver City CA. Without adequate water in the unit, the swamp cooler won’t be able to produce cool air. A leak could indicate that the inflow or outflow lines are clogged or that the float arm isn’t adjusted properly. You might also have a leak in the water lines feeding into the unit. Is Your Swamp Cooler Overdue for Service? Regardless of whether or not you’re currently experiencing any of the above problems in your commercial kitchen, you need to get regular swamp cooler service every 6 months. This ensures that your swamp cooler is in good working condition and helps prevent nasty surprises later on down the line. As part of your swamp cooler service, a technician from Flue Steam will inspect all the moving parts in the mechanical system, as well as check water levels and make sure that the swamp cooler’s pads are getting thoroughly soaked during operation. Then we’ll clean and reseal the entire unit to prepare you for six more months of reliable operation.